Audi Club Northwest presents "University of Quattro" Driver Skills and Autocross at the Monroe Fairgrounds/Evergreen Speedway on Sunday, February 26, 2017! Do you have a new car and want to learn what driving it feels like in challenging course design? Or have you ever really learned how to drive the one you have? Drivers with any vehicle brand are welcome to attend our events so please invite your friends and have fun together. University of Quattro is a place to push the envelope of your vehicle’s capabilities in a controlled environment with fantastic club instructors to work with you on becoming a better driver. This program has something for 15 year old drivers with a learners permit just starting their road experience, or the 50 year old that has always wondered if they really do know everything there is to know about driving. Audi Club Northwest is here to provide training for YOU the driver, the most important aspect of your car making it home safely every night. The University of Quattro program also qualifies you to attend high-speed instructed lapping events later this year, such as Son of Quattrofest on March 26th at The Ridge Motorsports Park and Verloren Gehen on April 8-9 at Oregon Raceway Park. Sunday morning starts with our Driver’s Skills (DS) program which includes a short ground school session where we'll discuss vehicle dynamics, how you can maximize your skills and minimize the chances of being involved in a collision, and fun in becoming a more polished driver. After the chalk talk we transition to the large paved surfaces at the Evergreen State Fairgrounds where Audi Club Northwest instructors will put you through a group of exercises designed to teach new skills and expand on familiar ones in a controlled but exhilarating way. This is great fun. Once you have experienced and learned from the exercises we will transition the pavement into an autocross. An autocross is a small course designed to test your new skills, and since it is timed you will be able to see your improvement as an instructor works with you on the strategies to better your next run through the course. This is where the fun REALLY begins. Expect to go home with sore cheeks as your smiling muscles will be the most tested of all. 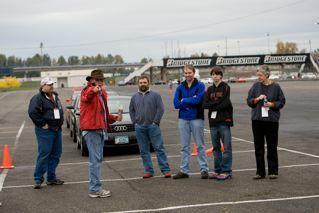 Learning to be better drivers is what Audi Club Northwest is all about. For information about what our driving schools look like please go to <http://www.archive.audiclubna.org/about-acna-topmenu-33/acna-driving-schools-topmenu-62>. This link gives you a good overview of the exercises and activities that Audi Club North America driving schools contain. Teen drivers are encouraged to take this course and Audi Club Northwest is offering a $25 subsidy. Parents can take the course too and have the same experiences and language to use in later conversations. You may share one car, but parent and teen must register as separate participants. This will be an all-day class and it will be the best focused time each of you has spent on driving skills. That's $175 total for teen and parent for the full day of instruction, practice, lunch together, and huge fun too. A parent or guardian needs to be onsite during the day with drivers under 18 years old. Minimum age is 15 years old with a current Driver's/Learner's permit. The program is focused on driver skill development and learning about how you and your car work together for a safer experience on the streets and freeways. A coach will be with you in the right seat of your car to personalize the whole event. • Driver Skills and Autocross with lunch, Adult. $100. Your registration includes lunch. Guest lunches are available for $15. An Audi car is not required for any portion of University of Quattro so feel free to invite friends and co-workers to this event. Audi Club North America membership is not required (although it is encouraged) for either the Driver’s Skills exercises or autocross. It is okay to bring friends with you to spectate. You may be able to arrange rides for them with designated instructors during the lunch break to experience first-hand what a Driver’s Skills day is all about. This is also an opportunity to just come out to an Audi Club Northwest event; meet some of the people involved, watch what is going on, and talk to us. You are welcome to spectate. Everyone who enters the facility must sign the waiver to be made part of the club insurance.